King Street is aligned north-south parallel to the River Great Ouse and, today, some 400 feet east of the river bank. Originally it was the main route in the ‘New Londe’ laid out by Bishop Turbe in the 12th century, an area of newly drained and planned town expansion lying between the Purfleet and the Fisher Fleet. 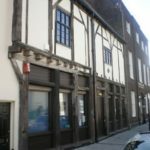 The sites of 30-32 King Street are the earliest known sites of domestic occupation in King’s Lynn. The centuries have left a complex façade. 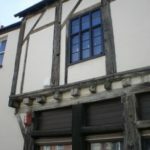 From north to south, No 32 is a 3 storey, early 19th century town house whilst No 30 and 28 are high two storeyed timber framed buildings of the late 14th century. However inside these exists a 12th century stone house complete with intact end gables, Romanesque arcading on both walls and a building line clearly defined and distinct from today’s building line. The three tenements were acquired by the Trust in 1975 who promptly arranged for surveys and plans. Gales in January 1978 blew in the brickwork of the north gable of No 30 and restoration commenced before more damage was suffered. In May 1980, the restored shell was opened to public view. 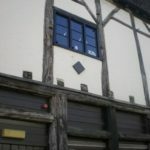 Investigations revealed a fascinating record of how the buildings have been modified over the centuries.